I love making bread, but most of my bread is just sandwich and toast loaves. I get a bit intimidated by fancy loaves or artisan bread, but I am always willing to increase my bread baking repertoire. Recently I checked out from the library Peter Reinhart's Artisan Breads Every Day. His approach to bread is so scientific I felt like I was back in college reading through the cookbook. In fact, I got a little bogged down just reading through the information and almost didn't get around to baking anything from the book before it was due back at the library. I was determined that wasn't going to happen, so I buckled down, and made some bread, the day before I had to turn the book back in. What bread, you ask? Oh, what bread - wild rice and onion. I love onions. The recipe was really simple. Make the dough the night before. Put it into a greased bowl, cover with plastic wrap and pop it into the fridge. In the morning I was greeted by an amazing sight - dough eagerly pressing against it's plastic containment field. I halved the dough and shaped one half into a boule and one half into a baguette. Then, I had to go run an errand. Oops. My rising loaves got simply enormous! As soon as I got home I popped them into the oven. The smell of those baking loaves made me swoon! My bread tasters were quite cross that I wouldn't allow them to tear hunks form the bread as soon as it got out of the oven. Verdict? Wonderfully good bread. Easy recipe to follow. This book is now on my Amazon wishlist. Try this recipe and I think you'll be sold, too. * Since cooking the wild rice takes a long time, double the amount you cook and put 1/2 of the cooled rice into a ziploc bag and store it in the freezer for the next time you make the bread. ** If you use dried onions, you may have to add an extra 2 to 4 Tbsp of water while mixing. 1- Combine all of the ingredients, except the egg wash, in a mixing bowl. With the paddle attachment at lowest speed mix for 1 minute. The dough should be sticky, coarse, and shaggy. Let the dough rest for 5 minutes. 2- Switch to the dough hook and mix on medium-low speed for 4 minutes, adding flour or water as needed to keep the dough ball together. The dough should be soft, supple, and slightly sticky. 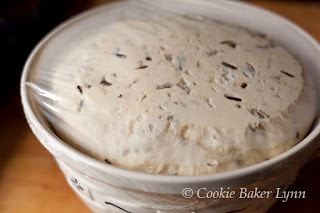 1- Remove the dough from the refrigerator about 2 hours before you plan to bake. Shape it into sandwich loaves (using 28 oz of dough for 4-1/2 by 8-inch pans, and 36 oz of dough for 5 by 9-inch pans) or baguettes or boules or rolls. 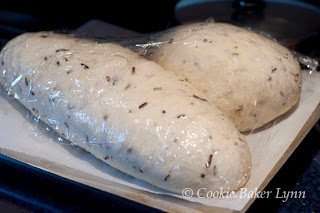 Proof the dough in the greased loaf pans, or on a baking sheet lined with parchment paper or a silicone mat. 2- Mist the top of the dough with spray oil and cover loosely with plastic wrap. Let the dough rise at room temperature for 1-1/2 to 2 hours, until it’s about 1-1/2 times its original size. Optional, brush the top with egg wash just before they’re ready to bake. 3- Preheat the oven to 350 deg. 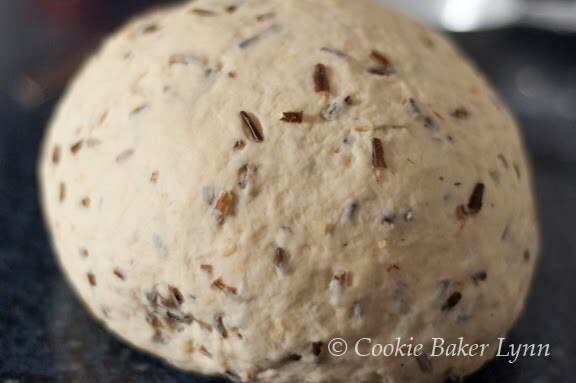 F. Bake the loaves for 10 to 15 minutes, then rotate the pan; rotate rolls after 8 minutes. The total baking time is 45 to 55 minutes for loaves and 20 to 25 minutes for rolls. The bread is done when it has a rich golden color, the loaf sounds hollow when thumped on the bottom, and the internal temperature is about 185 deg. F in the center. This loaf with the wild rice sounds delicious Lynn. I can only imagine the wonderful aromas permeating from your kitchen! How wonderful Lynn ! i wish I had a slice ! Interesting. We love wild rice...but would never have thought about adding it to bread. Must be delicious to serve with game or poultry! I am a huge fan of Peter Reinhart's books. I don't have this one yet. I love the sound of the cooked wild rice and onion in the bread. I can see I will have to make this one for sure! Your breads look irresistible. No wonder your family wanted to get at right away! 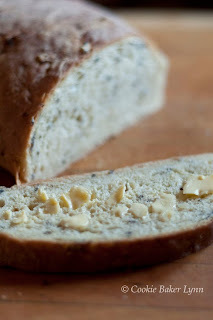 I love wild rice, but never think to use it in a bread--looks great! I knew recipes with cooked oatmeal but not with rice. This is very intriguing! This looks so delicious! I am fascinated by bread baking, still trying to decide which book to purchase. Thanks for sharing this one. Such a perfect dough, Lynn! this is defitely a lovely oaf of bread, excellent for a ahort tea break at work! yummy! Oh wow - that bread sounds amazing!! Oh, I love onions, too! This bread looks amazing. I've had that book on my amazon wishlist forEVER. Never thought to look for it at the library! Thanks for the ideas. Another thing that can be useful is to flatten the bag of rice before you freeze it. It's easier to thaw. Yumm I can just imagine how amazing this was! I love how the pieces of wild rice look.